It looks like Hilton Honors is now letting giving its members the ability to pay for purchases at Amazon.com with points. 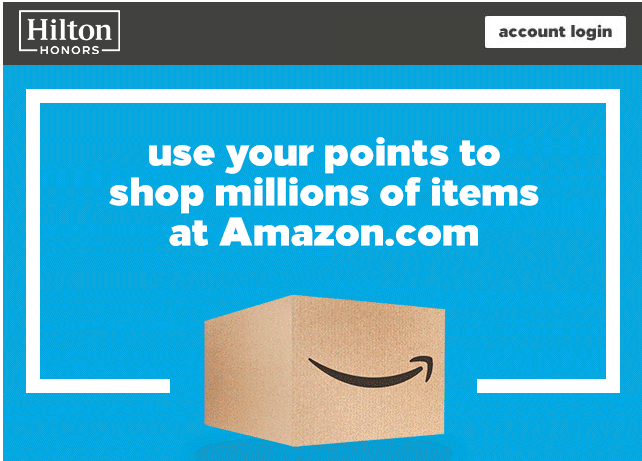 Check your emails, on instructions on how to link the two programs together, so you can start using points to pay for purchases at Amazon. This adds to the long line of rewards programs from various cards, such as Ultimate Rewards, Membership Rewards, Discover, and now Hilton Honors. Having the flexibility to pay for purchases at Amazon with points from other programs is good, but you have to weigh in the advantages and disadvantages. I personally, value Chase Ultimate Rewards, for redeeming for travel purchases, so I would never use them at Amazon.com for making purchases. I would however, use my Chase Ultimate Rewards cards for making the actual purchases. This opportunity is nice if you are sitting on some Hilton points, and have no idea what to do with them, and would rather spend them on everyday purchases, that you would normally make at Amazon. Now with that being said, Hilton Honors aren’t the greatest points to keep or hoard, as they have been devalued tremendously in the last couple years. You need A LOT to stay in some of the nicest properties, such as The Conrad Rangali Maldives, or The Grand Wailea in Maui. These require usually 75,000 to 95,000 PER NIGHT! …..ouch! However, they do have some sweet spots, and if you are like me, sitting on a few tankers full of points, then I do NOT recommend blowing them on toilet paper, or selfie sticks at Amazon. Redeem them for those magnificent properties that are category 8 or higher. This entry was posted in Amazon, Hilton, Honors, Ultimate Rewards and tagged Amazon, Hilton, Honors, Shopping, Travel by The Value Traveler. Bookmark the permalink.